Would you like to feel more confident when you smile, but don’t want to have to wear metal braces to align your teeth? We understand that some of our patients can be uncomfortable with the idea of others staring at their teeth, which is why we often recommend ceramic braces (also known as porcelain braces) to improve the alignment of your teeth. Below, you will find some of the key differences between ceramic and metal braces so that you can make the best decision for you or your child. For more information, we recommend that you schedule an appointment with our team or a reputable Grand Rapids orthodontist in your area that is experienced with ceramic braces treatment. Ceramic braces mimic the color of your natural tooth enamel. This means that unless someone is standing right next to you, it is difficult for them to see that you are in orthodontic treatment. Many adults seeking to correct their bite may choose ceramic braces to retain a professional smile and avoid the stigma of adult braces. 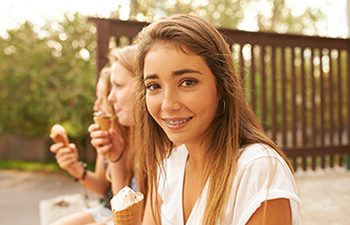 Teenagers may also benefit from wearing ceramic braces because they are less noticeable. Traditional metal braces can make anyone feel self-conscious, especially teenagers. If you are interested in the possibility of ceramic braces for your teen, we recommend having a conversation with Grand Rapids orthodontist Armbrecht and Wierenga Orthodontics. One downside is the cost of ceramic braces is higher than metal brackets. This has partly to do with the materials that are used. The ceramic brackets used at Armbrecht & Wierenga Orthodontics is the Radiance Plus™ line from American Orthodontics. They are made out of pure grown sapphire crystals that are honed and heat polished to look translucent. This allows your natural tooth color to reflect through the bracket. Determining the average cost of clear or traditional braces is difficult because each patient’s treatment plan is different. To fully understand the amount of orthodontics needed to correct your smile, we recommend consulting with your orthodontist. If you or your child need an extensive amount of orthodontic treatment for your best smile, your orthodontist may recommend traditional braces. Getting your teeth to move to their optimal alignment requires that a certain amount of pressure be applied. Most cases can be treated with either metal or clear braces, but a complementary consultation with our office will be able to determine if ceramic braces are right for you. The clear or white ligatures used with ceramic brackets are more susceptible to staining than their traditional colored counterparts. This is a constant concern during treatment, which is why your orthodontist will replace the clear elastic bands at each adjustment. The actual brackets for clear braces are stain resistant. Staying away from tomato-based foods, mustard, and other stain producing foods will ensure a successful course of treatment with clear braces. Ceramic brackets have a larger profile than metal braces. This can lead to increased lip irritation compared to the traditional stainless-steel bracket. We will always train you on the best ways to be comfortable through the course of your treatment so that irritation is minimal. It is important that you brush your teeth twice a day to avoid discoloration once the ceramic braces are removed. For more tips on maintaining a healthy mouth during clear braces treatment, we recommend having a discussion with your orthodontist. If you are interested in our ceramic braces treatments, be sure to call (616) 455-4800 for one of our Grand Rapids orthodontists or (616) 301-8900 for our Grandville locations. The dental professionals at Armbrecht & Wierenga Orthodontics pride themselves on helping people achieve their best smile in a warm and friendly environment.